Finally completed the roving that I have been spinning. This was supposed to be a PS4 North project! Anyway, ’tis done and is now part of my yarn stash. 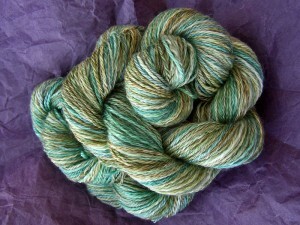 Washed: skeins washed in cool water and Eucalan. Significant colour loss. I did not enjoy this project. 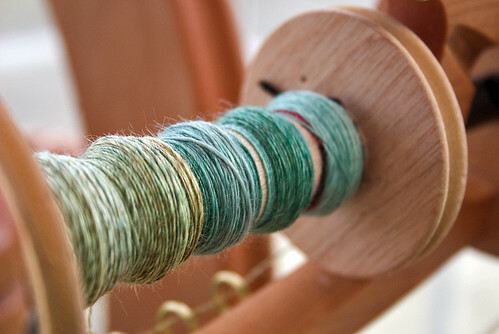 The fibre was difficult to spin and made my skin itch. I really made a hash of both the spinning andÂ the plying. The finished yarn seems limp and lifeless. It is very silky indeed. 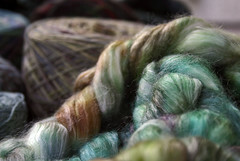 Completely different from the Merino/Tencel blend roving that I had from Copperpot – that spun like a dream and earned me a prize. The finished “Giggle” yarn had much more life and character to it. More of the Merino “spring” and less of the Tencel “drape”, I think. However, the colours are amazing, and I do love them very much. Unsure what to make with the yarn. Socks do not appeal. Perhaps Stefanie Japel’s Reclamation triangle scarf?